Eighth cutting in Arizona is moving quickly with the threat of rain next week. 70% has been cut and 40% has been baled, and most growers are expecting to finish up by the end of the week. In New Mexico, 4th cutting continues. Weather has been easy to navigate in this region and quality looks good as hay goes into bales. Third cutting began in some areas of the south Columbia Basin of Washington State and will be baled by the end of this week, at which point quality will be assessed. So far, we expect a small amount of export hay from this region. 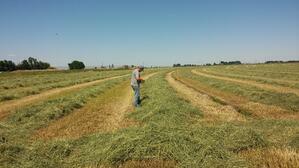 Straw harvest has wrapped up in Oregon and there were no quality issues this year.